European or ‘nanban’ traders are the main source for cannons and matchlock firearms, along with other valuable goods, such as silk from China. Their cargo also makes them a prime target for the notorious wako pirates who haunt the Japanese coastline. For protection, trade ships are fitted with powerful European cannons, giving them some of the capabilities of a warship. 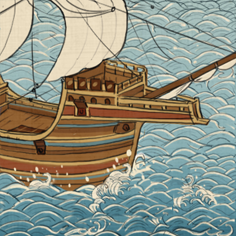 If a daimyo can afford it, and is willing to trust barbarous, uncouth Europeans, he can hire these ships for his fleet, but at a very high cost. A typical “nanban” ship was the caravel, a European design with two masts and lateen-rigged sails. Nanban means “southern barbarian”, the term used for the European merchants who traded with Japan from the 1540s onwards. Japan had little contact with outsiders, and Europeans were considered coarse and crude when measured against traditional Japanese etiquette. The nanban trade brought European weapons and goods from China, but suspicion of European motives and the influx of Christian missionaries eventually resulted in the policy of “sakoku”. In 1633 Japan became a ”locked country” and foreigners were banned from entry.